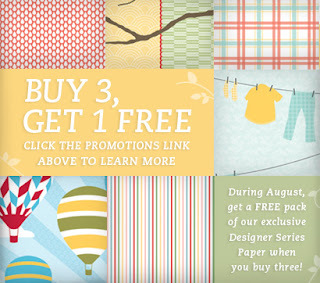 I love sales and this month Stampin' Up is having a sale on Designer Series Paper. When you buy 3 packages, you get one for FREE! You can buy all different designs or get them all the same. It's up to you. :) The paper packs that are included in the promotion cost $10.95/pack. You can find them on pages 184-186 of your catalog. Sorry, but the Specialty papers ($12.95) and the big Paper Stacks ($21.95) are excluded.